The high pixel count of 24.1 effective megapixels delivers high-definition images with fine details of the subject enabling expression with sharpness and depth. The image maintains high resolution even if it is trimmed and printed in large size after shooting. 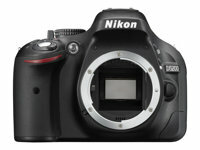 The D5200 employs a Multi-CAM 4800DX autofocus sensor module. 39 focus points track even a fast-moving subject precisely. Furthermore, performance of auto-area AF and 3D-tracking is improved in combination with the Scene Recognition System that utilizes a 2016-pixel RGB sensor.